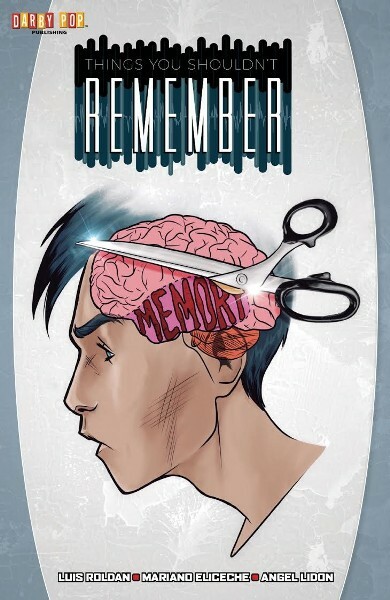 Los Angeles, CA (August 10, 2017) – Things You Shouldn’t Remember, an all-new, full-length mystery/science-fiction thriller, releases as a trade paperback book on August 30, 2017, courtesy of Darby Pop Publishing. This graphic novel was written by Luis Roldan with art and cover by Mariano Eliceche. Logline: Things You Shouldn’t Remember follows a quartet of strangers from across the United States who find themselves being hunted down and killed because of random, seemingly innocuous recollections. Synopsis: Dozens of people from all across the United States suddenly find themselves recalling random things: song lyrics, places, and events that seem to have been erased from both collective memory and recorded history. Fearing the spread of a virus-like plague, a mysterious group known as “The Handlers” is tasked with hunting and destroying those who recollect. But, does the end justify the means? And what if YOU were the one whose mind was unwittingly filled with Things You Shouldn’t Remember? 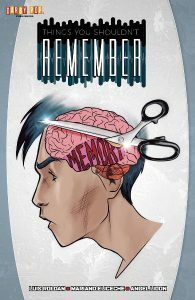 “Featuring an ensemble cast reminiscent of TV series such as Lost, Sense8, and The Leftovers, Things You Shouldn’t Remember serves up a cocktail of adventure, horror, and humor in a story that will keep you guessing…and make you wonder if your own memories should be trusted,” said Jeff Kline, founder of Darby Pop Publishing. The Things You Shouldn’t Remember trade paperback hits comic book stores, bookstores, and online retailers on August 30, 2017, and will be available for $19.99. It can be ordered by retailers from Diamond Book Distributors with Diamond Code JUN171443. Founder Jeff Kline started Darby Pop Publishing with the goal of using the visual medium of sequential art – aka comic books – to tell all-new stories. As a life-long lover of the form, Jeff convinced a small circle of his movie/TV friends to join him as he “broke into” comics after writing/producing more than 1000 episodes of television over the past two decades. Four years and nearly one hundred separate releases later, Darby Pop Publishing continues to be a creator-owned labor of love.